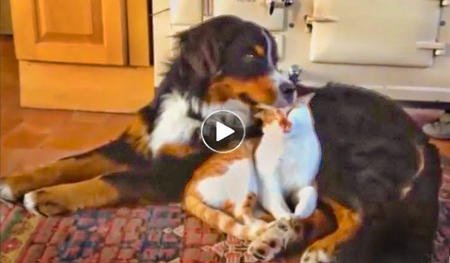 This very funny and heartwarming viral video, Be Together–Not the Same, features a hodgepodge of animals of different species, romping around together and having friendly fun. 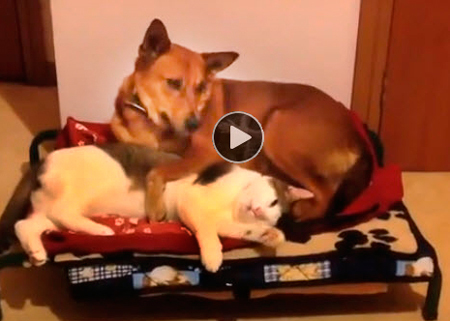 Here is a hilarious viral video compilation of dogs and cats. The cats are annoying the heck out of the poor canines they live with in a variety of ways, and it’s surprising the dogs put up with it without retaliating. Here is a hilarious viral video compilation of dogs and cats and other animals like monkeys, racoons, giraffes, who look very funny, silly and cute while eating in unusual ways. Hey who says that cats and dogs don’t get along much? They get along, but often disagree what the best way to get along is. 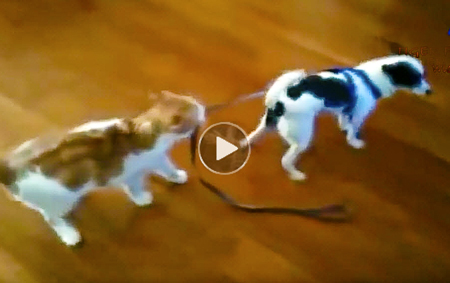 Here’s a hilarious compilation showing how cats and kittens play with and mostly annoy dogs. While trying to get along? When dogs like you, and you don’t like them, they don’t give up trying to win you over. 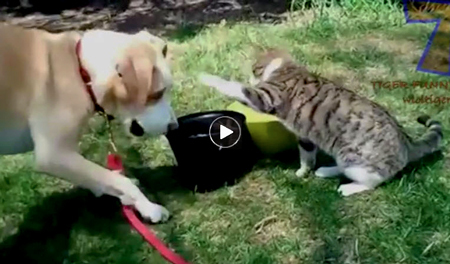 Here are some extremely determined dogs and their humorous attempts to befriend cats. Unfortunately for dogs, their in-your-face style of friendship doesn’t mesh very well with personal space-loving cats. But after many repeated rejections, some canines finally get the felines to change their minds. If yoga is about controlling the mind and body, there is no greater test than practicing with a dog or cat on the loose. As Danielle Cuccio, a yoga instructor and owner of two pugs tells us, “They think it’s playtime or that it’s some kind of game. They think, ‘Mommy is on our level. Let’s get her!’ They actually challenge me to stay balanced in a pose so I think it makes me stronger.” Watch this funny video compilation and see why every yogi should own a pet for the ultimate yoga challenge of all. I can see why this video went from zero to over 4 million views within a week–it’s fun, fun fun, gots lots of happy dogs, killer song and done up in a high quality production. 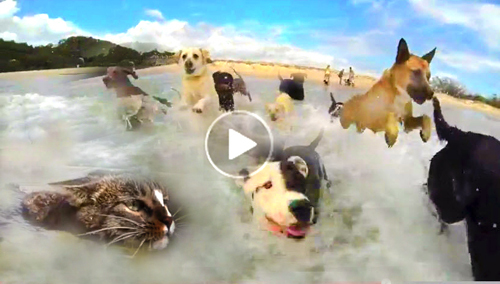 And the bonus of also having a crazy cat who happily goes swimming in the ocean with the canine party animals. The happy dogs are having a great time with their day at the beach, frolicking and digging in the sand and splashing crazily in the surf. The swimming cat goes by the name of Didga and I hear he evens surfs in another video. This video is perfectly synched to the Pharrell Williams hit song Happy and watching these canines having such a good time will make you happy too. Wonderful funny, cute collection of animals doing the classic “bang you’re dead” trick. Hell I didn’t even know a hamster could do this trick. Or cats. My animal Oscar noms go to: German Shepard–does dramatic spins before he meets his maker; Cat #2–very believable method acting ; first hamster–they added a “bang” sound & the little guy was so good, I thought it was real & got upset. Who would you nominate for an animal Oscar? Enjoy! 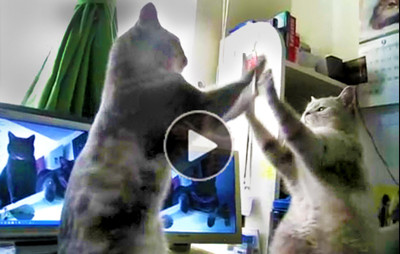 I thought this viral video was pretty funny with just the cat patty cake thing going on. But then the cats start talking and takes it to a new level. A couple of guys found the original clip and did a great job writing the dialogue and then performing it with impeccable comedic timing. My hat’s off to them for the fine effort and I think they deserve their 20 million views. Thanks guys. 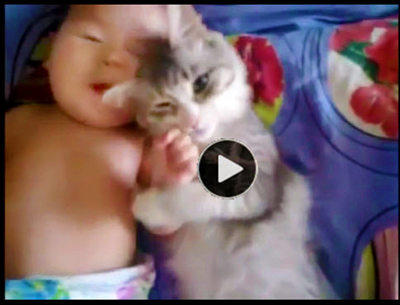 This is the cutest baby and cat video I’ve ever seen! It’s almost too cute. These two are just enthralled with each other. Whenever you’re experiencing stress overload, a few seconds of this snug fest is the medicine that will instantly lower your blood pressure to bliss level. Enjoy. So I finally gave in and let my dog, Enzo, pick a video this time, and he came up with a cat who barks like a dog when no one’s looking. I admitted to Enzo, that it did fool me, and it is good for a quick snicker. Arf! A cat that barks? What is going on here? 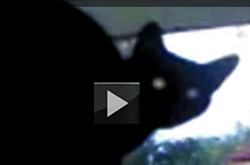 Yasmin Gazelle finds out the truth behind this canine-impersonating feline.